Usually, health supplements are delivered as capsules, but Vibrant Health Joint Vibrance is one of the exceptions to the norm, as it comes as powder that you can mix with other liquids, for better results. Combining no less than 21 ingredients, this powder enjoys many positive reviews, so it is worth checking out. It looks like nothing is left out, and that the product is appreciated by people with pains in their joints. The manufacturer offers a thorough explanation on the ingredients, as well, so you can understand clearly what each one does. What Does Vibrant Health Joint Vibrance Contain? As you can see, there are many ingredients in this particular joint health product, but there are many extras that are there only to add taste, and help the user consume it, such as the citric flavors. Also, the fact that the formula is delivered as powder may be not that attractive for many. The manufacturer recommends one serving daily, or a scoop of powder mixed with various liquids. If you are taking this as treatment, you can increase the number of daily servings to two. 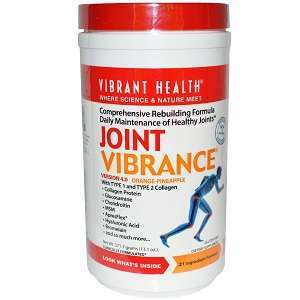 One bottle of Vibrant Health Joint Vibrance contains about 21 servings, and it is priced at 49.94USD. The company offers 90 days money back guarantee from the date of purchase, which is quite generous, compared to other similar products. Vibrant Health Joint Vibrance sounds like a great, reliable product, as it combines the power of many clinically ingredients needed for joint health. Using a combination of collagen sources, it looks like it will cater to every need you may have, whether you experience pains, inflammation or you just lost mobility due to achy joints. Still, if you are not crazy about the powder formula, there are equally powerful products on the market you can try, in tablet form. Mark Stevens	reviewed Vibrant Health Joint Vibrance	on November 8th	 and gave it a rating of 2.5.